Following is a link to download a Microsoft Excel spreadsheet. 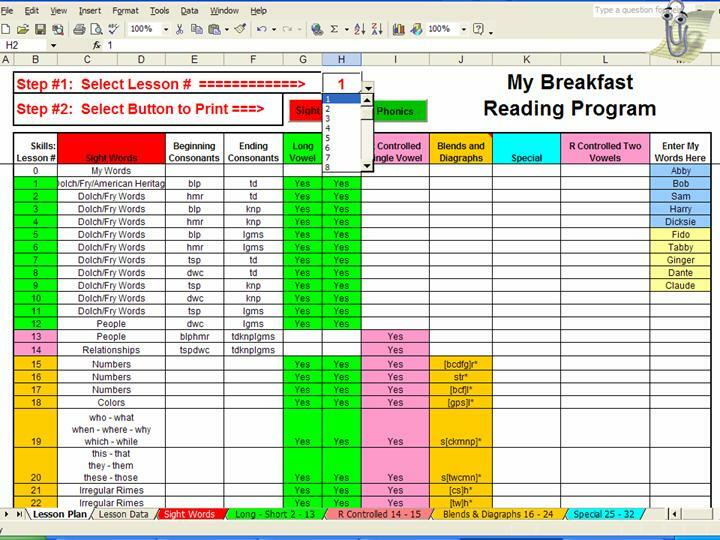 This spreadsheet creates worksheets for practice and/or timed drills. The first tab also allows you to create your own by entering 10 words, letters or phonemes in the My Words column. Each time you refresh (F9) the worksheet, it will randomize the results. That is, you can create a new worksheet for each skill. When downloading, SAVE the file and run a virus check on it. Then open it and select Enable Macro. Using the first tab, select a lesson number, click on the Sight Words or Phonics button. This will run a macro to place you in Print Preview. You may need to adjust the margins to better fit your printer settings.